As the season ramps up to full gear, we're looking at mostly assassins picked up in the mid-lane, kill supports, and of course, highly mobile marksmen. Meanwhile, high damage poke mages are climbing up Tier 1 as natural rivals of assassins early game, and if they can gain an edge early they can quickly rip apart would-be assassins. Alistar [Tier 1 Support] - Most melee supports are less favored than their ranged counterparts in the current meta, with Alistar being the exception. While professional play still sees Braum as a counterpick to certain teams, Alistar remains the only staple melee in support player repertoires in solo queue. His high durability and initiation power is greatly valued. Cassiopeia [Tier 1 Mid] - In this meta with nerfed assassins, Cassiopeia is able to abuse mid-laners with ease. Her high DPS and kiting abilities make her a favored pick when it comes to mid lane carry champions. Cassiopeia [Tier 2 Bot Carry] - Where she finds success mid-lane, Cassiopeia has been a favorite of bot lane players looking for magic damage to supplement their pool. She covers a lot of the same roles as marksmen when it comes to sustained damage and ranged kiting power, and thus fills a certain niche. See more on that here. 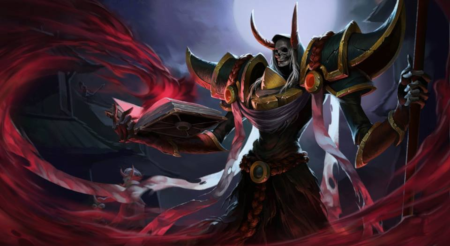 Karthus [Tier 1 Jungle] - Karthus in high divisions is at a pick/ban status. His incredibly high damage means that unless he's completely squashed in jungle with weak supporting lanes, he can stack up Dark Harvest and end up an absolutely unstoppable force. His early game damage is also quite good with isolated Q's, so would-be invaders may find themselves unable to contest. Morgana [God Tier Support] - Now that solo queue has ramped up to full speed, Morgana is back in everyone's hearts as a simple, yet highly effective support. Her Black Shield keeps marksmen safe from the various high crowd-control kill lanes, and her bind synergizes perfectly with champions like Caitlyn and Jhin. Nasus [Tier 1 Top] - The buffs to Nasus were quite good, and he rose rapidly through the ranks for top lane. Players in solo queue are abusing him heavily to gain LP in a safe manner. He has relatively few poor match-ups, and as long as he can survive for a few levels almost every lane ends up being a powerfarming lane. Sylas [Tier 1 Jungle] - Sylas is still trying to find a niche on the map, but most players are opting to bring him to the jungle as a result of his low range and difficult gap-closer. In the jungle, he can pick his angles and maximize his return. Zoe [Tier 1 Mid] - When it comes to poke champions, Zoe is tough to beat. In the current meta she's often found alongside Ezreal on the same team. This results in a highly oppressive poke pattern that whittles down enemies with ease. Zyra [Tier 1 Support] - The nerfs on her mana are definitely apparently. However, that hasn't stopped her mid to late game from being continuously oppressive. While her popularity has weaned a bit, she's still just as beloved as before for her insane damage output.